Ivan Potapov, of Russian Liverpool FC fansite LiverBird.ru has produced an in-depth comparison of the performances of Liverpool managers past and present. As I wrote before for Russian-speaking supporters, I had been very sceptical to Roy Hodgson since I heard he would be appointed as a manager of Liverpool FC for the first time. It seemed really obvious for me he wasn’t good enough to be a manager for the club like ours, and his experience meant nothing because he was a flop with two big names he tried to manage. Unfortunately for us my expectations were finally met when he began to work with Liverpool FC. It’s just half a year passed but we reached some lows we didn’t reach for some fifty years. Graeme Souness, probably the worst manager we had since Don Welsh, did much better in some areas than Roy did. But some people try to defend Hodgson even now when some stats for the fifty years were brought to light by one of the Daily Post journos. They say it’s not fair to compare Roy with others because: 1. he’s been there just for half a year; 2. his work is in progress; he managed Liverpool for 30 games not hundreds of them as other managers did. Okay then, it’s time for me to suggest my little statistical overview started from December 1959. 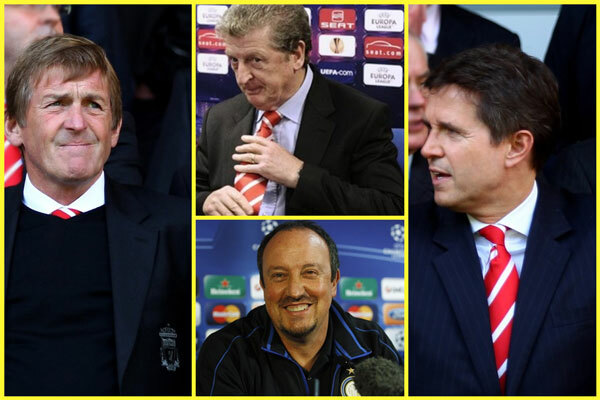 I tried to compare our managers and hoped I could find out how each of them started here at Liverpool FC. Each “period” covers just first 19 league games (or first 30 games in all competitions) for every manager. It’s fair to Hodgson, isn’t it? My overview has its weaknesses (what doesn’t?) but I’ve tried to reduce them. For those managers who began their work in mid-season I decided to use not only a beginning of their careers but the beginning of their full season at the club as well. And for Bill Shankly, who began his work when our club languished in the second tier of English football and won the old Second Division with us in 1962, the first 30(19) games of his third full season at the club were added. For some observers who blamed Benitez for everything he did I added the beginning of 2009/2010 season, our worst as we thought at the time. I marked extreme values with colors – green for the best and red for the worst. Roy Hodgson (July 1st 2010 – Jan 1st 2011): 19 Premier League, 6 Europa League, 4 Europa League qual., 1 League Cup. Rafael Benitez (July 1st – Dec 26th 2004): 19 Premier League, 6 Champions League, 2 Champions League qual., 3 League Cup. Rafael Benitez (July 1st – Jan 13th 2010): 20 PL, 6 CL, 2 FAC, 2 LC. Gerard Houllier (July 1st 1999 – Feb 13th 2000): 25 PL, 2 FAC, 3 LC. Gerard Houllier (Nov 12th 1998 – May 16th 1999): 26 PL, 2 FAC, 2 UEFA. Evans/Houllier + Gerard Houllier (July 1st 1998 – Jan 9th 1999): 21 PL, 6 UEFA, 1 FAC, 2 LC. Roy Evans (July 1st 1994 – Jan 14th 1995): 24 PL, 1 FAC, 5 LC. Roy Evans (Jan 31 1994 – Oct 29 1994): 27 PL, 3 LC. Graeme Souness (Jul 1 1991 – Dec 18 1991): 19 1D, 6 UEFA, 5 LC. Graeme Souness (Apr 16th 1991 – Nov 30 1991): 21 1D, 5 UEFA, 4 LC. Kenny Dalglish (July 1 1985 – Dec 26 1985): 23 1D, 4 LC, 3 Screensport Super Cup. Joe Fagan (July 1 1983 – Dec 22 1983): 18 1D, 4 EC, 7 LC, Charity Shield. Bob Paisley (July 1st 1974- Dec 14 1974): 21 1D, 4 EC, 4 LC, Charity Shield. Bill Shankly (July 1 1962 – Mar 5 1963): 27 1D, 3 FAC. Bill Shankly (July 1 1960 – Jan 21 1961): 26 2D, 3 LC, 1 FAC. Bill Shankly (Dec 1 1959 – Sep 3 1960): 28 2D, 2 FAC. Obviously Hodgson’s statistics could be catastrophic but he was “saved” by the Europa League. Liverpool were drawn against Macedonian and Turkish minnows in the preliminary rounds, so we cruised past them. But in league games the statistics look awful. Half a season passed with him winning less games than any Liverpool manager in his first season according to the table above. He almost reached an all time low with the number of goals we scored (23 against 22 for Souness) and lost almost as many games as Evans did in his first 19 matches (but Evans was appointed in mid season). And Hodgson is the only Liverpool manager with a negative goal difference after 19 league games; Souness did better than him! Some of Hodgson’s defenders cry for time. “Give him some time and he will turn us into a real force,” they yell. But I cannot agree. He has great players in his squad, not Zamoras or Hangemanns, but they’re really good footballers and he had time he needed to fix his own mistakes but he didn’t. There was a period in Liverpool history when we changed the manager who worked even less than Hodgson. I don’t mean Ronnie Moran or Phil Thompson who were asked to fill the gap when Dalglish resigned and later Souness and Houllier couldn’t manage because of their health. We had joint managers, Evans and Houllier, and the idea didn’t look good from the start. They couldn’t work together and eventually Evans resigned in November 1998. I decided to compare statistics for Evans/Houllier’s 18 games (12 in PL) with the same stat for Hodgson. And the first 18(12) games of the 2009/2010 season were added because it was a “catastrophe”, wasn’t it? Evans/Houllier (July 1 1998 – Nov 12 1998): 12 PL, 2 LC, 4 UEFA. Roy Hodgson (July 1 2010 – Oct 31 2010): 10 PL, 3 EL, 1 LC, 4 EL qual. Liverpool played their 12th league game under Hodgson on November 11 2010. Rafael Benitez (July 1 2009 – Nov 9 2009): 12 PL, 2 LC, 4 CL. Houllier and Evans failed in 1998, Benitez failed in 2009, but what about Hodgson? What about goals scored? What about goal difference? Did Liverpool play under him better than under Benitez just a year ago? Benitez won 50% of his league games but Hodgson won just a third of them. You can do whatever you want with statistics. It’s just about numbers. But I can give you an answer to the main question we ask ourselves every morning and noon: Is Roy Hodgson the right man for the job? The answer is obvious. **** — 1 2 Statistics for the beginning of the season 1998/1999, which we started with the Evans/Houllier duo as our managers. To match the number of matches I added some games of the season after Evans’ resignation. ***** — 1 2 Statistics for Roy Evans, since his first full season at the club (1994/1995) began. ****** — 1 2 Statistics for Roy Evans from the moment when he became a manager (Jan 31 1994). ^ — 1 2 Statistics for Graeme Souness from the beginning of his first full season (1991/1992). ^^ — 1 2 Statistics for Graeme Souness from the point when he became manager (Apr 16 1991). ^^^ — 1 2 Statistics for Bill Shankly at the beginning of his first season in the First Division (1962/1963). ^^^^^ — 1 2 Statistics for Bill Shankly from the point when he became manager (Dec 1 1959). Follow Ivan on Twitter: @ingumsky. Former Liverpool manager Rafael Benitez has responded to the latest round of attacks on him by current Reds manager Roy Hodgson. Hodgson yesterday described an 1-0 away win at Bolton, courtesy of a very late goal, as a “famous victory”. Despite Roy’s description this match is unlikely to feature in any “hall of fame” featuring Liverpool’s genuinely famous victories down the years. It was Liverpool’s first away league win since April, but Roy’s first away league win in 442 days. Before that match came some quotes from Roy dismissing Kenny Dalglish’s credentials to become Liverpool boss a second time and accusing Benitez of freezing Kenny out of Melwood. Hodgson said Dalglish, who has won the league four times as a manager, was “good at” scouting, working at the academy and playing an ambassadorial role. “You cannot find a better person for that than Kenny,” said Roy, who got the manager’s job at Anfield despite a CV that raises big questions about the criteria used to select him. As Liverpool’s season slid from bad to worse with embarrassing defeats at home to Blackpool then away to Everton there were calls for Roy to be removed from his post. Many felt it was better for the club if Kenny was to take over in a caretaker capacity until the club could secure a suitable replacement. Perfect excuse? Or just a worried Chelsea fan? Fresh quotes this morning blaming Liverpool’s on-field mess on the owners’ off-field meddling have been attributed to Rafa Benitez, in an “exclusive” by Rob Beasley. But can we believe them? Rob Beasley is a journalist working in London for the News of the World. If you’ve ever been unfortunate enough to have seen him speak on the Sky discussion show “The Sunday Supplement” you’ll probably take much of what he says about Liverpool with a pinch of salt. Especially if what he’s talking about somehow relates to Chelsea, who happen to be the Reds’ opponents today. Beasley is the one who claimed he had been kept informed of Jose Mourinho’s intentions with regards the England job, right up until the moment he was told that Mourinho wasn’t going to take the job because he’d got a better offer from a club side somewhere. He claimed he got regular texts off Mourinho. Beasley is also the one who knew about Ashley Cole’s dodgy discussions with Chelsea when still an Arsenal player, he knew about this tapping-up incident before either Arsenal or the authorities did. Considering that the only people who would have known about it then were the player, his agent and Chelsea, it narrows down the possibilities of who tipped him off, and of who wanted to make it harder for Arsenal to hold onto their player. Reading most of his articles, listening to most of his comments, his apparent love of Frank Lampard and Chelsea jumps out of the page at you, his comments often seeming clouded as a result. The only time he seems to have had a pop at Chelsea was when he claimed – exclusively – that Avram Grant would be gone by Christmas, Steve Clarke within two weeks. That was at the end of September, after a run of four (he put it in caps) games without a win. Both are still there of course. Beasley got it wrong. Did he make it up? Continue reading Perfect excuse? Or just a worried Chelsea fan?